Pebble Hills University offers multiple “top-up” degree programmes (distance learning) for the Higher National Diploma (or other qualified diploma/degree which is recognized by Pebble Hills University) graduates who wish to pursue further studies at degree level. Students with relevant Higher National Diploma can expect to accomplish the required courses within 1 year and be awarded with a bachelor degree upon satisfactory performance. HND in Nigeria: The Higher National Diploma is a two-year program. Admission is based on the National Diploma and students are usually expected to have at least one year of relevant work experience after obtaining the National Diploma. HND in UK and Ireland: A Higher National Diploma (HND) is a higher education qualification in the United Kingdom. This qualification can be used to gain entry into universities, and is considered equivalent to the first or second year of a university degree course. is accredited by International Accreditation Organization (IAO) for achievement of highest standards in Organizational Management, Business Management and Business Performance through a commitment to quality and continuous improvement in Education. IAO is associated with world's leading and nationally recognized quality assurance agencies worldwide for betterment of educational standards. Some of the current IAO partners are : Department of Adult & Higher Education, Ministry of Education (Bhutan), The National Commission for University Evaluation and Accreditation (Argentina), The National Higher Education Accreditation (Costa Rica), The Accreditation and Quality Assurance Commission (Palestine), The Agency for Development of Higher Education and Quality Assurance (Bosnia and Herzegovina), Accreditacion Agencia (Chile), The Quality Assurance & Accreditation Council (Sri Lanka), Public Agency for accreditation of Higher Education (Albania), Center for Quality Assurance and Accreditation for HEI (Libya) and Higher Education Quality Evaluation Centre (Latvia), etc. International Education Accreditation Commission recognizes IAO's accreditation standards. This is an International Accreditation Organization (IAO) certified program. 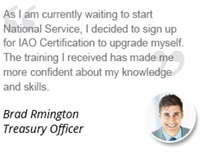 You will be eligible to apply for the IAO Certification for Business Professionals. The IAO Certification for Business Professionals is an international industry credential that validates skills of the business professional for the international business world. The fastest growing internationally recognized certification, IAO, grants certifications to professionals belonging to the business world. Moreover, an Equivalency Diploma and Comprehensive Evaluation Report will be issued by the California University Foreign Credential Evaluator (CUFCE). Furthermore, graduates are eligible to apply for the membership and relevant chartered award from the Chartered Institute of Professional Financial Managers, USA and Chartered Institute of Management and Leadership, USA. Plus, Graduates are eligible apply membership and/or Chartered Member (C.Mgr) status of Chartered Institute of Management, Canada. Graduates of this program are eligible to join the Institute of Management Specialists (IMS), UK, The Academy of Executives & Administrators (AEA), UK. In addition, the Society's Board and Academic Review Council (ARC) of Society of Business Practitioners (UK) has recognized graduates of the PHU MBA to qualify for a Senior SBP Award. Professional Managers Association (PMA) will accept PHU’s graduates for full Membership of the Association. These with Master’s degrees can enter the PMA at Certified Professional Manager (P.Mgr) level. Pebble Hills University students are accepted for membership within the Managerial Chapters of Design, Technology and Management Society International (DTMSI). Applicants are admitted into the Managerial Chapter of the Society, which are the general membership divisions within the Society. Suitably qualified members are invited to join various subdivisions such as the MBA and Professional Managers Guild. Students can enroll at anytime from anywhere. There is also flexibility in pacing the course. All of the courses are distance learning courses offered online through our eCampus. PHU online courses operate on an open enrollment policy; there are no enrollment deadlines. This means the distance learning course starts for you on the day your registration is accepted. Registrations are processed and accepted on most business days. Pebble Hills University offers multiple “top-up” degree programmes (distance learning) for the Higher National Diploma/Diploma/Associate Degree graduates who wish to pursue further studies at degree level. Students with relevant Higher National Diploma can expect to accomplish the required courses within 6 months and be awarded with a bachelor degree upon satisfactory performance. We assume you have acquired the relevant knowledge in your major. US$1,950 if you complete the program in one year; US$2,050 if you complete the program in three years. Average GPA of 3.0; any outstanding financial obligations must be paid; on completion of the top up degree the student will be awarded with a full Bachelor’s degree. If you have transferable credits from other tertiary educational institutions, these can count towards the requirements for most PHU qualifications.